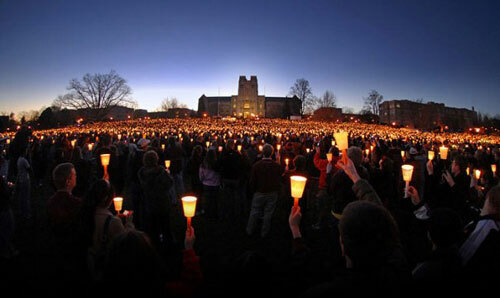 At 8 o’clock that evening thousands of students and other members of the university community gathered on the drillfield for a candlelight vigil to remember and mourn the victims. Those who were there recall the convocation, the vigil, and other swiftly organized commemorative events as powerful moments of togetherness, reflecting a strong determination to find unity and strength after the tragedy. There were also, however, areas of uncertainty and confusion, some of it avoidable and some not, in the days after the shootings. One set of decisions that some in the community look back on with mixed feelings had to do with how to finish the academic year and whether students should remain on campus or go home. Under university policy, students could accept the grade they had earned up to April 16 and not attend the remaining classes or do any further assignments. They could continue to do classwork if they chose, and if the additional work improved their record that would give them a higher grade for the course. But if completing further assignments would lower their grade, they would still get the one they had on April 16. Guidance for faculty members, as one of them recalled, was to announce that policy and “to be as flexible and forgiving as possible” in carrying it out. John Ryan: Basically, students could just decide to take the grade they had and go home. Many students attempted to come back and go to class but it was meaningless. So after the first day back many classes just emptied out. Laura Agnich: They went back the first day, so they were kind of looking for that structure, for a sense of community, but then it was lost and they just went home. Faculty members were also unsure — and received little guidance — on how to deal with the event in the classroom when classes resumed. Ryan: Many faculty felt that they were not prepared to have this discussion, they weren’t trained to have this discussion, they weren’t comfortable. That’s something to think about too, about the various roles that people are expected to play. And you’ll read in the Review Panel report that a lot of the people who were dealing with the families had not necessarily been trained to do that work, that it was a very ad-hoc sort of thing. Donald Shoemaker: We were never told and still don’t know who the injured victims were. And they could have been in your class. Those of us teaching courses on violence had to be careful about what to say and how to say it because you never knew who might have been closely affected. We did have counselors outside the classrooms when we returned. But there was no personal communication with professors about the students in their class who were directly affected. The families of wounded victims and those who were deceased were warned not to talk to the press and I think they were told a lot of scary things about the press. I remember talking to one family. They didn’t speak great English and it was hard to explain to them what I was doing. And they told me, we’re scared of the press, we’re scared of the media, and that made it hard. Sometimes I would go to the memorials, and students would have signs up, “Media go away,” but I’d see one of them in tears and I just did what came naturally which was to go up and put my arms around them. A lot of times they didn’t want to talk to me and that was OK, but a lot of times they did want to talk to me. Like “aftermath,” the word “survivors” does not have a single, precise definition. In its narrowest sense, the word identifies two specific groups: those who were in the room or the building and at risk of being hit by Cho’s gunfire, but were not killed; or alternatively, family members and close friends of those who died. More broadly, it can mean a wider category of people who were not directly in danger or closely connected with the victims but were close to the event and strongly affected by it. That definition would include the student body and faculty as a whole, the rest of the university community, and perhaps also the residents of Blacksburg and the surrounding area. Even more broadly, to the extent that instant and highly intensive coverage of the shootings engaged a nationwide audience in the story and the compelling emotions it caused, viewers and readers across the entire country might be considered survivors, at least momentarily. In a somewhat different sense, the university itself can be called a survivor too. Like the individuals affected by the tragedy, the institution also experienced loss, stress, disruption of normal life and a struggle for recovery — including, as more than one speaker observed, a struggle not to let the shootings come to define the university’s identity. Students return for the final week of classes, we have commencement, then in June the Office of Recovery and Support was created. We took over the work of the family liaisons in August, right as school was starting, so they were with the families through the summer. In that time we created and completed and dedicated the memorial. Classes resumed and case managers were hired in the Dean of Students Office and the Cook Counseling Center to work with students who were having mandatory psychological evaluations. We had some big fall events that I think helped the larger community — a football game against East Carolina University and a Dave Matthews concert. And I think they were really meaningful for people getting together. We had new employees, they hadn’t been at VT very long, all the way to an associate vice president for student affairs. The families who had folks who had a longer tenure at VT, had a bigger picture of Virginia Tech, had more knowledge of resources perhaps, those families had one experience, vs. families who had liaisons who had lesser knowledge of VT bureaucracy. Very few if any had knowledge of Virginia government or the compensation fund available for physical injury, funds available for victims of crime. Those were things that people at VT had no knowledge of. Now the Virginia legislature has mandated that any time there are victims of crime, government agencies come in and help navigate all of this. What we should have done was marry victim advocates from the state with our family liaisons, because those advocates have so much knowledge about what’s available for victims of crime that our liaisons didn’t know. And we’re still as of last spring introducing our families to those people. So it’s still taking a long time.